Mini Golf was once an incredibly popular pastime in the US. It was one of the top outdoor summer activities for families and had a good run from the 1950s to 1990s. The activity has seen a decline in popularity over the past decade or so. Kids didn’t have the same interest in this old-fashioned activity. Families didn’t have the income to spend on these sorts of treats. As a result, many independent mini golf providers went out of business. Childhood landmarks were mourned by locals that were simply no longer using them. Despite this drop in participation, there is hope for the future of the mini golf industry. Economic changes and creative ideas are building towards a potential resurgence in the activity. 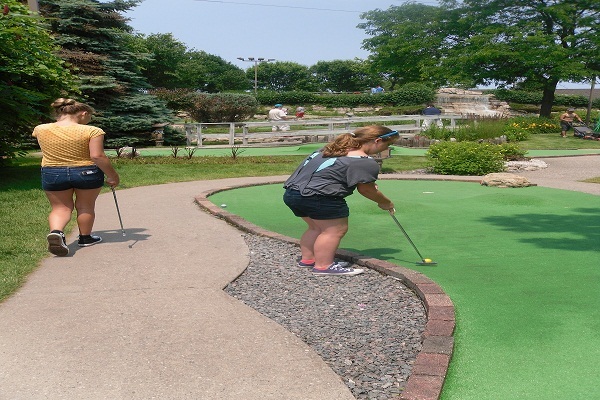 The Future Of The Mini Golf Industry In America Is Largely Dependent On The Improving Economy. The recent economic recovery in America could really make a difference here. The rise in employment and increased disposable income could see families more willing to spend money on entertainment options like mini golf. The industry had experienced a decline at an annual rate of 2.5% up to 2012. Data from the US Census Bureau states that more than 98% of companies have just one location and over 50% of those make less than $250,000 in revenue in a year. 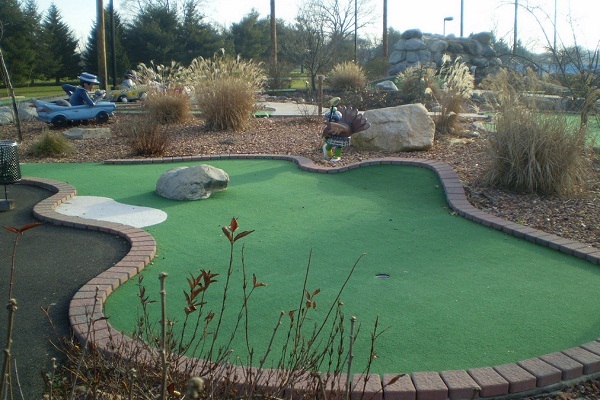 There are two major players – Putt-Putt LLS and Monster Mini Golf. However, the rise of the quirky, independent golf course suggests that a change is in the air. There Are Two Different Directions That Companies Can Take In Order To Bring In The Modern Crowds. Companies seem to have two choices here. Either they create the most unique, inviting course they can, and focus on that one experience, or they diversify. Some, such as Putt-Putt, have expanded into “fun centers”. Families can come for the array of opportunities for entertainment. Families can play in arcades, take part in laser tag, play in go-karts or anything else that the center feels is good for business. These big companies feel that this is the most viable route to profitability. Revenue that may be lost be focusing so specifically on mini golf can be regained with other games, gifts, and restaurants. Other companies are sticking with mini golf as its own attraction. They are simply looking for new and exciting ways to make this retro sport more appealing to a modern audience. Some companies are even looking into special incentives for great shots. This could mean photographic evidence of success or the promise of a free game if you can get a hole in one There are a few key mini golf industry trends can be seen across facilities in America. These include strange lighting, unusual obstacles, modern technology and indoor options. There are many courses are being redesigned with new layouts and strange obstacles to providing a bigger challenge. For example, Parking in Lincolnshire, Illinois has an elevator in a model of Chicago’s Willis Tower and a roller-coaster hole. Other courses have started to bring lasers into the routes for a completely new challenge. Others are looking into new technology and unusual challenges. This could include forfeits and challenges on how to play a shot based on the spin of a wheel. make the game unique and give gamers more a challenge. The Trackball feature from GoGolf is could help to modernize the mini golf industry. The ball tracks each move per hole so players don’t have to rely on physical scorecards anymore. 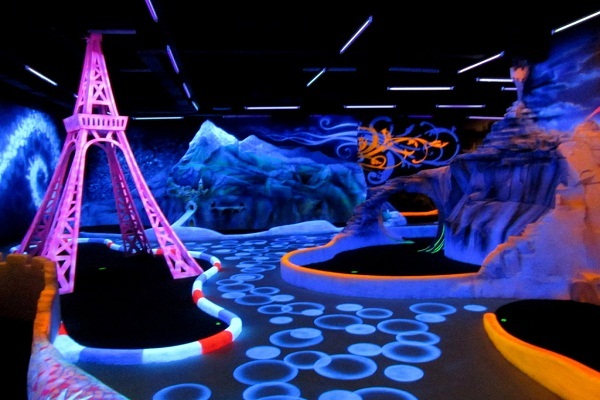 Glow in the dark golf is becoming a big deal in America and the principles can be easily scaled down to a mini golf course. All designers need are some neon lights, glowing flags, and UV-activated balls. It definitely worked for cosmic bowling so the mini golf industry should benefit too. Others, like the D&D Miniature Golf in Tennessee, simply use black lights reflected off of statures. Finally, there is a clear trend for taking the golfing experience indoors. This has a number of potential benefits. The most important have to be the fact that this allows for year round play. Poor revenue at traditional courses can often come down to a lack of playable days and seasonal opening hours. Indoor courses are ideal come rain or shine. They also provide a whole new space to work with. A great example of this is the Molten Mountain in Myrtle beach where players play within a volcano – complete with eruptions every half hour. Is This The Best Step Forward For The Mini Golf Industry. Some will see these modern designs as a negative step forward. To some, they take mini golf courses away from the designs of our youth and their simplistic form of entertainment. Others welcome this rise in creativity as a way of saving the mini golf industry. The encouraging thing about this creativity is that it can take mini golf course design into some interesting directions. Some will focus on the design, such as the San Francisco company that created a handmade course that relies on beauty alone. Others can focus on the technology. Either way, this means greater diversity in options, a boost in the number of courses that are out there and the chance for a greater recovery. Companies appear to have realized that there is no limit to what can be made and how unique a course can be. For example, there is the bible-themed course at Lexington Ice Center in Kentucky. As long as a course has all the basic elements and a good theme, people will want to play. 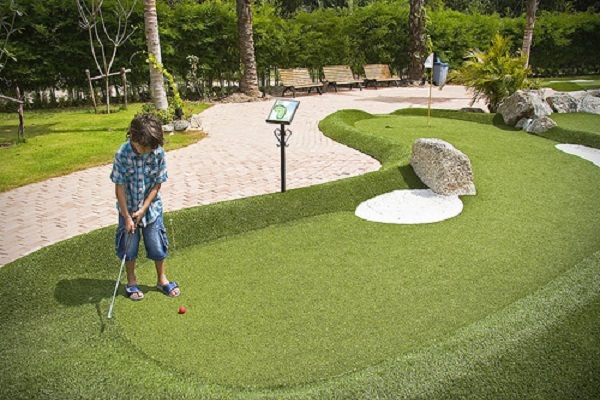 A quick Google search of the best mini golf courses for families today often brings up lists of the more unique and quirky options. This suggests that the future of the mini golf industry may be safer in the hands of these independent creatives than the big companies with their fun centers. There is still an appetite for mini golf in America if it is done right. Right now, they seem to involve strange indoor locations, digital tech, and quirky themes. I am interested in this business I live in a tourist location in a coastal town with lots of seasonal traffic, in need of more recreational activities.